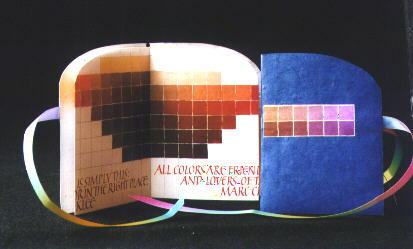 Concertina book based on a larger edition of "COLOR SENSE" (a Munsell color sphere book) done earlier. The larger book has approximately 22 pages and is available from the artist. The MT Exchange version is a smaller edition with blue curved cover and rainbow ribbon closure. The pages are color copied in both editions and the quotes on color are in relaxed Roman caps.